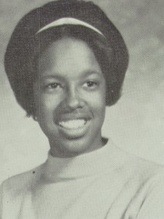 Did you know that Gayle King, CBS This Morning co-anchor (and, of course, Oprah’s best friend), lived in Menlo Oaks during the late 60s through early 70’s and graduated from M-A? Her father’s job as an engineer brought them to Menlo Park. The Kings were the second black family to move into Menlo Oaks. As far as we know, our family was the first. My father was a private practice physician in Menlo Park for nearly 50 years. Our two families became very good friends. We lived on Berkeley Avenue near Bay Road. The Kings lived a block over on Menlo Oaks Drive near Colby. The Kings had four daughters and no boys, and our family had three girls and no boys. Mr. King and my dad, who became friends, were out numbered 9 to 2 by the “female factor!” They didn’t stand a chance! The four to six year age difference between Gayle and my sisters and me is insignificant now, but in 1970 she was 16, and my sisters and I were between 10 and 12 years old. Those few years made a big difference then. Therefore, though Gayle’s sisters, Sharon, Lynn and Caryn, all hung out often with my sisters and me, understandably, we were too young to hang with teen Gayle. What I most remember about Gayle is her being in her room studying and that she had a Bill Cosby poster on the back of her bedroom door. The Kings moved away to Maryland, but Gayle stayed behind in Menlo Park to finish high school (graduated in 1972 I believe) and lived for a year with M-A teachers Roger and Peggy Heathcote. The ties that bind loosened over the decades and there was less and less contact with the Kings once they moved away. One day after almost 25 years of not seeing my Mom, Mrs. King totally unexpectedly rang my Mom’s doorbell. Mom answered the door and started (happily) screaming when she saw Mrs. King! From then on they kept in touch by phone until Mrs. King’s death in 1994. My sisters and I last saw and spoke briefly with Gayle at M-A at the 2002 All Class Reunion. She was being followed by TV cameras from the Oxygen network.